Jennifer Lopez has just been announced as this year's recipient of the VMA Video Vanguard award. The news was announced by Sway Calloway and JLo via MTV's Facebook Live feed. This marks the third straight year that a woman has been awarded the Vanguard award. P!nk took the honor home in 2017 and Rihanna won in 2016. 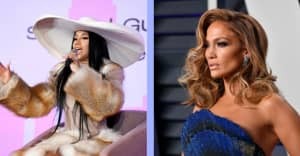 Lopez, who is also nominated for two awards (Best Latin Video and Best Collaboration), will be performing during the awards show — which will air live from Radio City Music Hall on August 20. JLo's last VMA performance came in 2001, where she performed her 2000s smash hit "I'm Real" with Ja Rule.